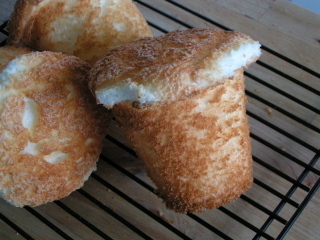 I adore Angel Food Cake. It has been my birthday cake of choice every year since I could first choose. I also love Angel Food Cake from a box mix. It tastes just fine to me and is super easy. Plus, you will not get salmonella poisoning from licking the bowl as all egg whites are of the dried form. I also adore Not Martha's blog. I have learned about so many techniques and happenings on her site. Plus, you gotta love a blog that has a category devoted to cupcakes. 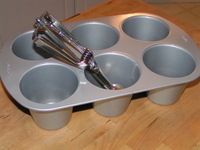 I saw the Wilton King Sized muffin pan in her cupcake envy post and had to have one. It was pretty inexpensive at Michael's ($7.9 9). 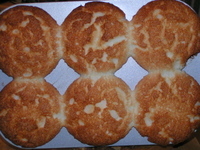 So I decided to make individual angel food cakes. So easy! 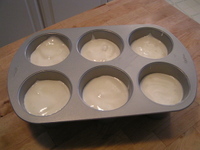 My tools: Wilton King-Sized muffin pan, small ice-cream scoop, boxed Angel food cake mix, water. Fill cups 2/3 full and bake at 375 for about 17 minutes. Put pan on its side too cool. Uh oh - I put too much batter in, as photos show (sorry about the flash). It made it difficult to get the muffins out. Next time, I will fill less full and eat 1/2 the batter. Cover Angel Cakes with strawberries and eat. Those cupcakes look super yummy! Now I want a pan, too!